If you are planning to promote and market your business online, you just cannot avoid using pay-per-click (PPC) advertising. 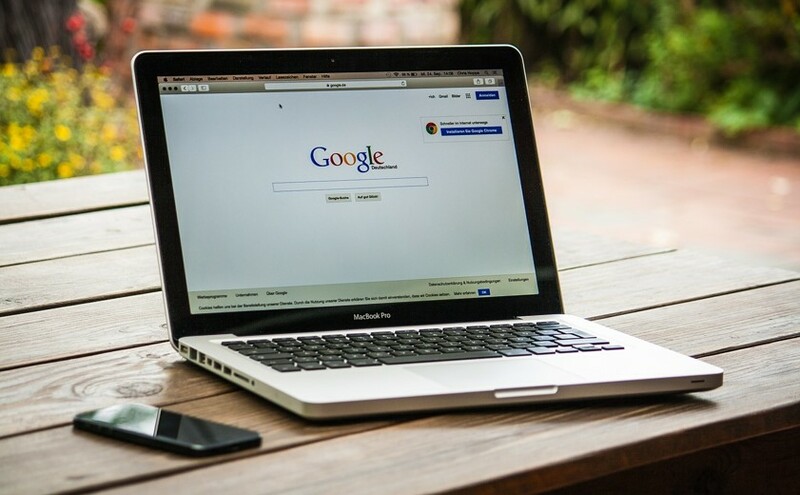 Google, with its AdWords product, enjoys the lion's share in paid online advertising, but managing PPC bids can at times require a lot of hard work and is often considered a laborious task. To make it easier for search engine marketers to run paid advertising campaigns smoothly, since they are tasked with the management of hundreds of pay-per-click ads, bid management tools have been introduced to help them manage their PPC campaigns without putting themselves under the burden of running these campaigns manually. In this article, we will list the most effective and popular PPC Bid and Campaign Management tools that are quick, cost effective, extremely easy to use and provide search engine marketers maximum conversions. Note: This is not a classification, the platforms below are not sorted by a qualitative point of view. The enumeration has the only purpose of a more readable content. 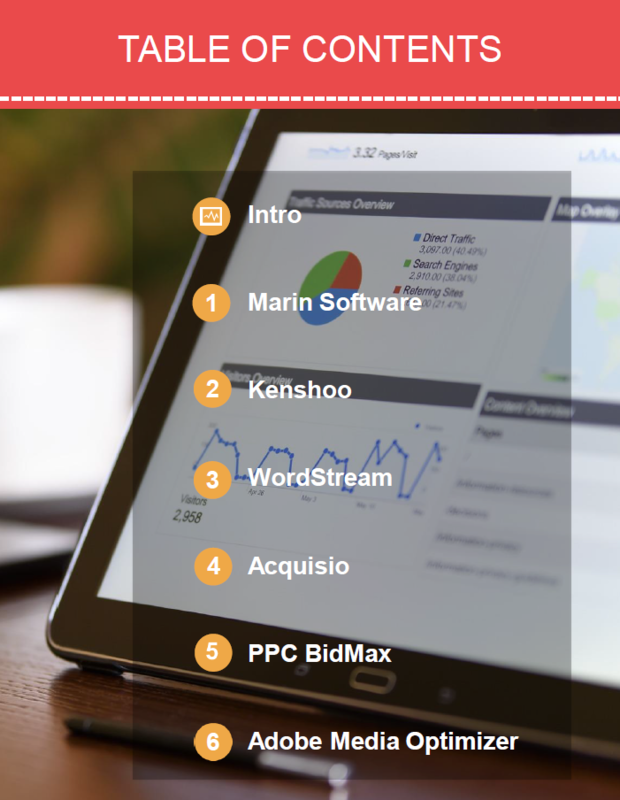 Marin is a powerful, easy to use and efficient desktop and online PPC management tool. With this tool you can use AdWords to set up bids based on a variety of different events and enables you to bid towards several other events, for instance, submission of contact forms or video views. Marin is a bid management tool that lets you post ad campaigns on search engines and social media sites. An account on Marin is easy to navigate and manage. It provides marketers with essential features to increase their paid search performance. It also provides an automatic evaluation of keywords that can help in improving the performance and visibility of their ad. Marin is able to integrate the 3 advertising giants: Google, Amazon and Facebook in just one ad campaign. Integrating and aligning these platforms, Marin allows you to amplify your results and to monitor everything you need to know in the same place. The best feature of Marin is that it utilises feedback from social media in posting campaigns and also makes use of mobile advertising to reach out to a wide population of smartphone and tablet smartphone users. Marin also provides you with illustrated reports and analytics providing a clear and excellent analysis of your campaign. Kenshoo is an online enterprise level PPC bid management tool that also offers effective local solutions for small scale advertisers. Whether you are an entrepreneur running your own company or a search engine marketer looking for the online paid advertising solution, you can find a variety of bidding types and solutions on Kenshoo, such as portfolio, rules-based or model-based bidding. It also offers A/B testing and advanced reporting. Kenshoo is considered an effective tool for its programmed accounts that are great for campaign creation and can successfully drive clicks for increased traffic. It provides real-time detailed reports, offering users to view insights and information. 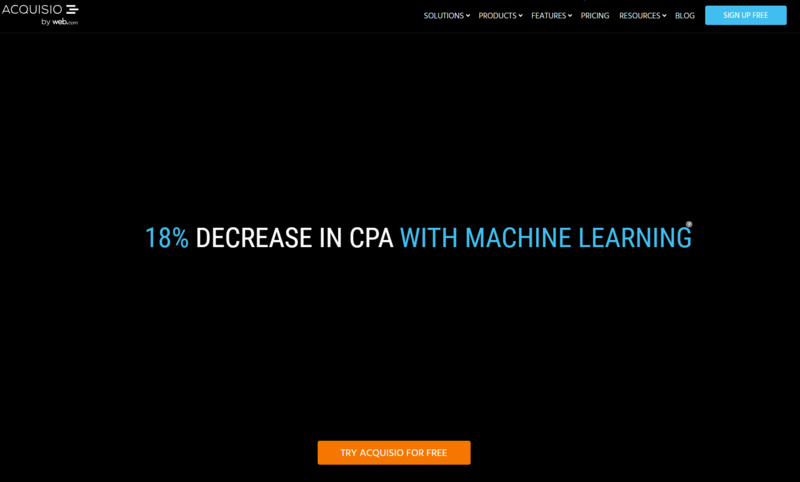 No matter what your budget is, Kenshoo converts that budget into online ads. It lets you target only desired customers based on their geographical location. Kenshoo utilises 7 unique algorithms that aids clients in choosing the right keywords to reach their target audience. It also makes use of model and rules-based bidding in order to enhance results. It also provides useful formulas for analysing and checking your campaign results. Kenshoo provides a variety of different products: Kenshoo Social (for search engine marketing campaigns), Kenshoo Local (for individual stores, dealers, or franchisees), Kenshoo Search (for social media marketing campaigns), and SmartPath (for analysing your campaign from the consumer interactions point of view). For each of those services, you can request a demo trial. 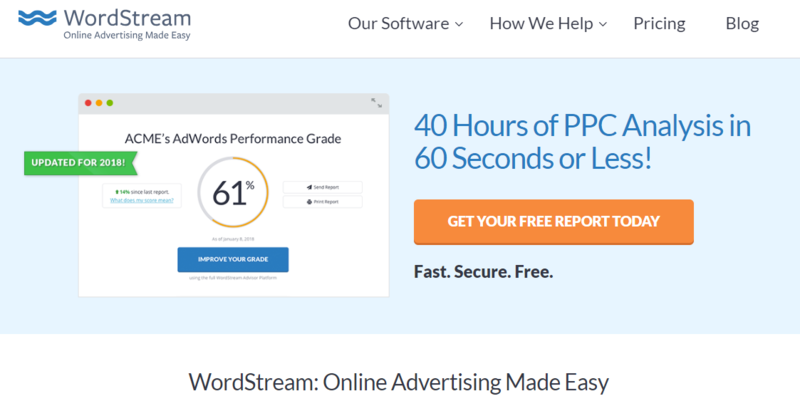 WordStream PPC Advisor is an efficient and reliable AdWords tool for creating and managing ad campaigns. It gives you recommendations for only those bids that are based on your goals week and demand. It combines keyword discovery, grouping, analysis, organisation and prioritisation. Wordstream's online bid management tool does not require you to spend all your time and attention on managing your campaigns. It is an easy and simple bid management tool that requires 20 minutes a week. 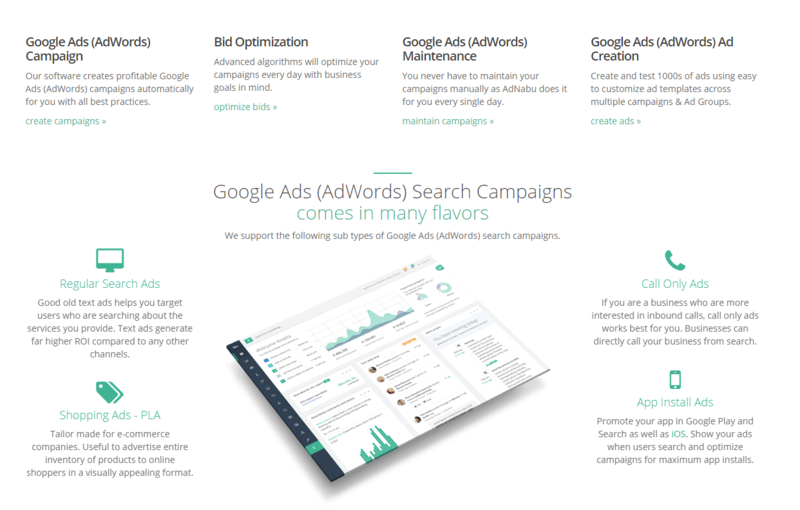 WordStream PPC Advisor uses AdWords and Ad-Center to create campaigns. It enhances the quality of ad campaign ensuring increased traffic and revenue. This online solution also provides marketers with quick feedback from several search engines. 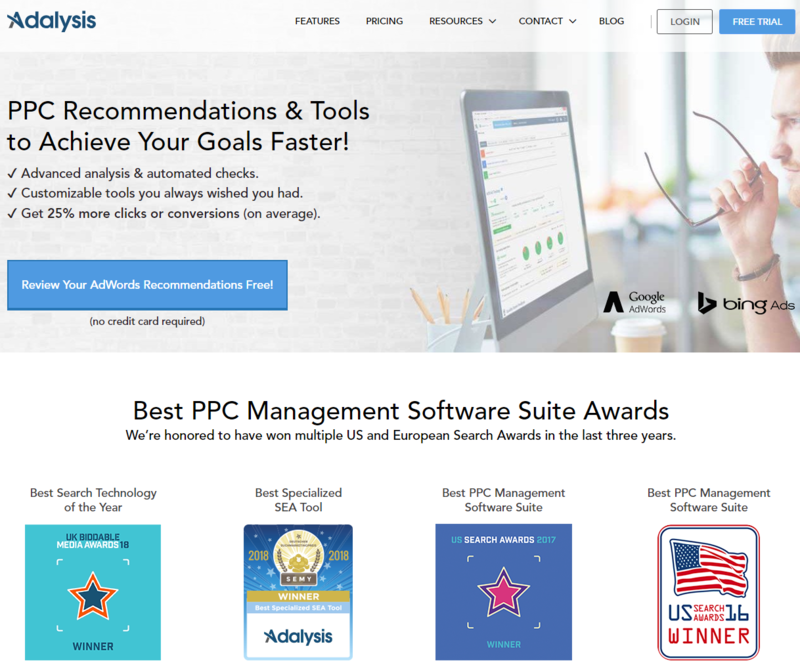 Acquisio is a big players in PPC bid management world. If provides a leading online campaign and bid management tool that has features for managing Facebook as well as paid social and display retargeting. Acquisio AdWords tool also has the ability to change bids automatically based on that events that you define. It allows marketers to create, track, manage and optimise their online ad campaigns on different search engines on its easy to use campaign creation tools. Acquisio offers cross-channel reporting that enables marketers to manage their campaigns on several platforms from a single dashboard. It also offers keyword search across a variety of online platforms to help search engine marketers to reach their target audience in less time. The strong points of this platform are the ability to optimise the campaign performance, to scale your projects, to automate the scheduling and the data sourcing, and finally to increase productivity. You can try Acquisio for free. PPC BidMax tool provides flexible and automated bidding for Google Ad centre and Google AdWords. The best thing about BidMax is that it improves traffic with maximum results. This innovative tool gives search engine marketers the advantage of managing their bid campaigns for a variety of search engines, including Yahoo, Bing, Google, etc. all from one simple dashboard. It also makes use of complex and sophisticated algorithms for useful analytics and reports. In order to understand if this product suits you, BidMax offers a quick tour to learn how to use it and a free version to try. Adobe Media Optimizer is an advanced tool that automates search, mobile, and PPC campaign management. 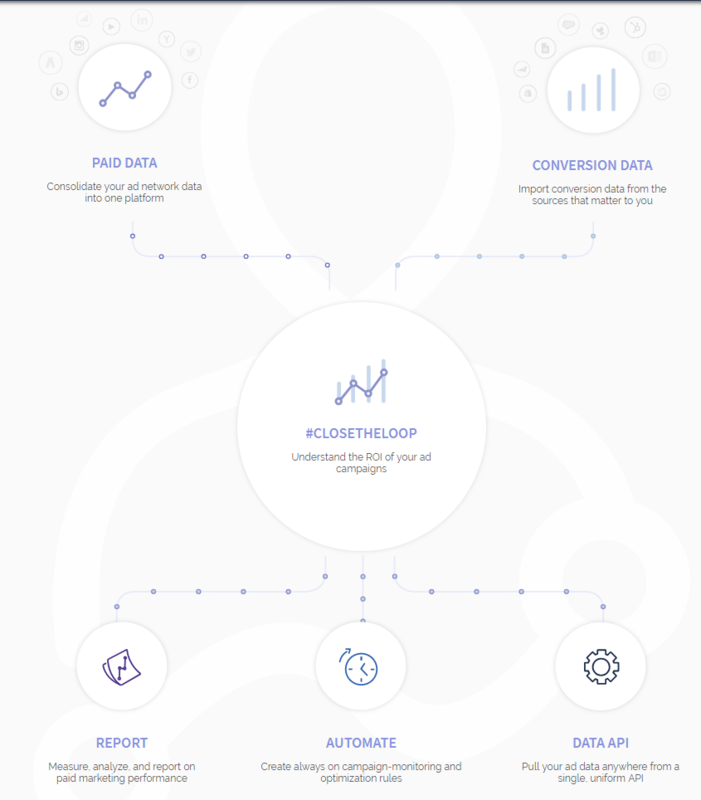 This AdWords tool is a unique programmatic ad-buying solution that helps marketers forecast the best mix of display, display and social ads that are based on their budget. It automates the execution of their comprehensive media plan and helps them find the best way to deliver and share relevant content with their high-value audiences. Set checks and alerts for keywords, quality score, domain, ads, landing page etc. This platform won several US and European Search Awards. Adalysis offers a 14-day free trial and the credit card details are not required. 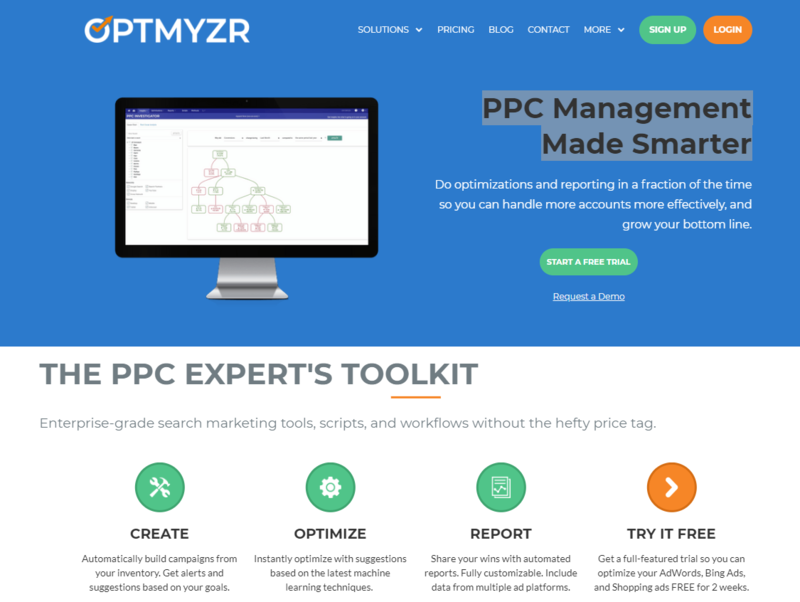 Optmyzr motto is "PPC Management Made Smarter". When you launch an ad on the platform, you instantly get alerts and suggestions based on your goals and previous campaigns. The automated report allows you to share it with your team and bosses. Enhanced Scripts™ (it works just for AdWords) allows the tool to write and store for you the Google AppScripts code. Optmyzr won several awards. It's possible to request a demo and start a free trial. SunnyReports is a platform made in France and geared specifically towards Google AdWords. The user is able to decide what kind of ad report he/she prefers to get (i.e. conversion rate, impressions, CTR etc.) and how to visualise it (e.g. graphs, line chart and so on). The SunnyReports website provides a well-stocked and useful dictionary about AdWords reporting terms. On the platform home page there is a saving calculator. A 14-day free trial is available. 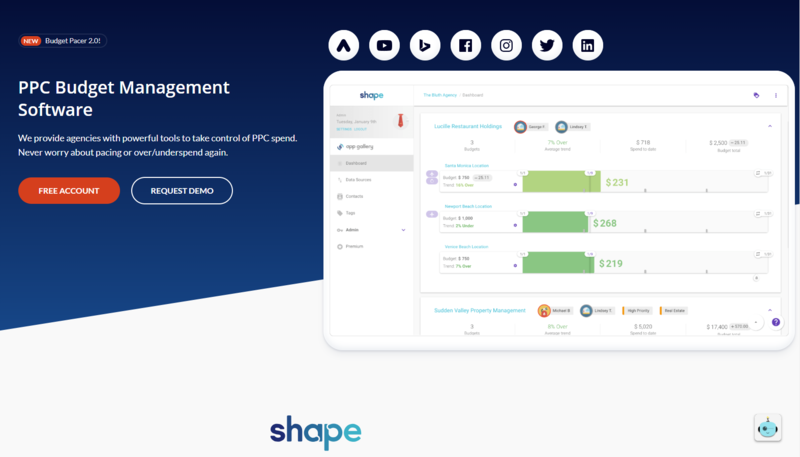 Shape is a unique tool for all your PPC campaigns and platforms you use (it supports Google AdWords, Bing AdCenter, Facebook Ads, and LinkedIn Ads). A great Shape resource is AutoPilot, an algorithm that pauses your ads when they reach the budget you have decided in advance, even if you are not at the office. Furthermore, the PPC Budget Pacer notifies every day some budget suggestions, automatically tailored differently for each user. Booster Score is a proprietary tool that forecasts the maximum spend potential for every campaign, while RollOver is an automatic mechanism that adjusts the budget by moving under/overspend from one cycle to the next. SmartSync imports your campaigns automatically on the platform. Report. When a campaign has been launched, you have access to a considerable variety of reports (and report forms), about the conversions, the budget monitoring, the goal pace and so on. Automate. In order to avoid wasting time, the platform offers an automation side for scheduling or rotating new ads. Data Api, that connects ad data across all the networks. Integrations with the most important ad platforms (Facebook Ads, Google AdWords, LinkedIn Ads, Instagram Ads, Bing Ads, Twitter Ads, Yahoo! Gemini, and YouTube Ads). On the website, you can see the AdStage different solutions for each type of industry and portal (from e-commerce to high education and more). A 14-day free trial is available. App install ads, for promoting an application on Google Play or Apple Store. It's possible to register for a 14-day free trial. Invoca is a tool that offers a variety of solution for marketers and sales reps who need to know more about people calling to them. The platform is not geared only towards the paid advertisement, but it has an extension for Google AdWords. 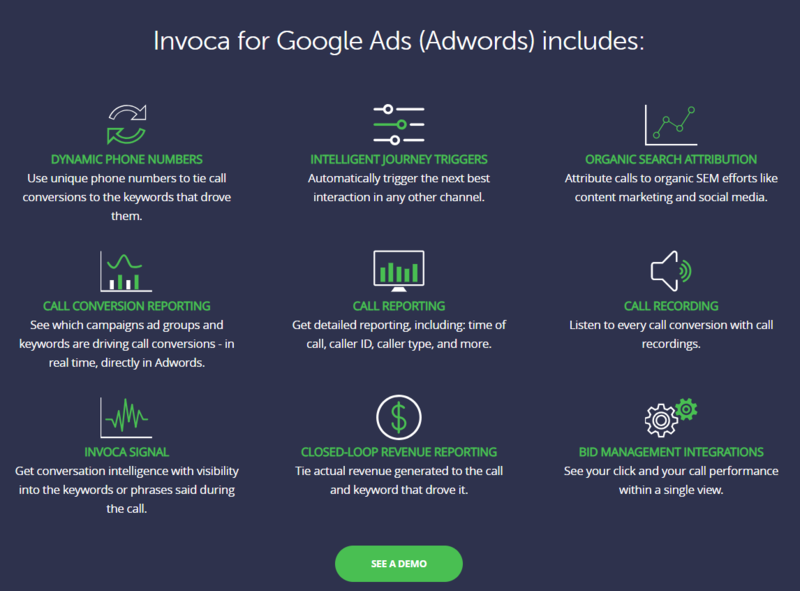 Indeed Invoca gives you tons of insight into which of your paid search efforts are driving people to call. The platform allows you to track and analyse billions of calls and understand how to spend your budget more effectively. Invoca's call intelligence is also associated with other PPC portals we've mentioned right above, such as Kenshoo, Marine Software, Acquisio, and Adobe. 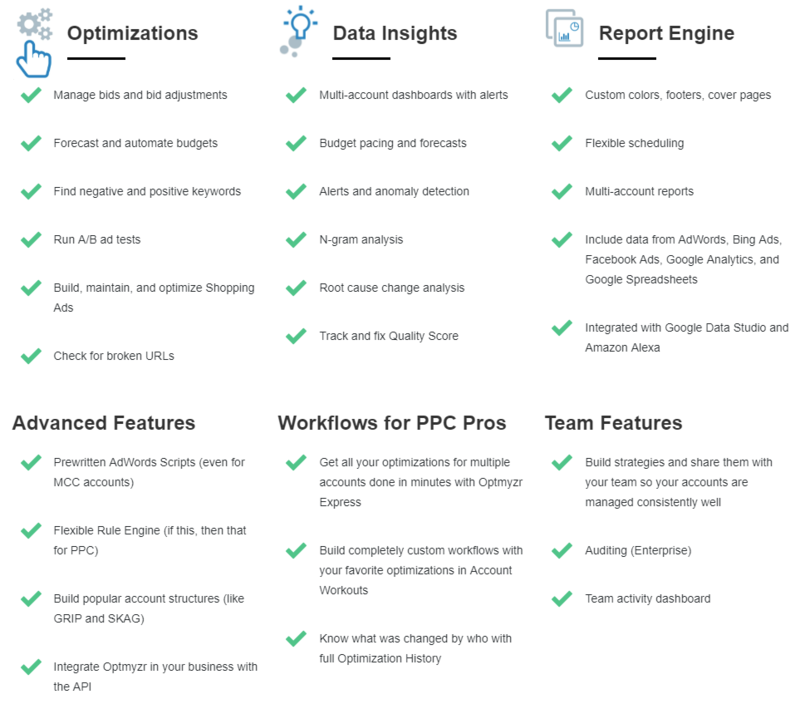 Do you know of other great PPC bid & management tools? Let us know by posting a comment below. If you are using (or used) some of the platforms in the list, please share a feedback. We will take your thoughts into account. Note: the article was published in 2017 for the first time. This is an updated version (2018).